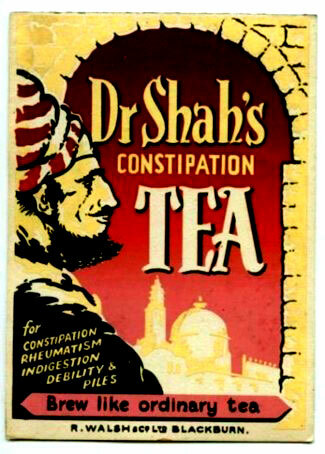 "Dr Shah's Constipation Tea for Consumption, Rheumatism, Indigestion, Debility and Piles." "R. Walsh & Co. Ltd Blackburn" Fantastic image of the "Shah" who has just ingested a cup of his own tea and has been cured of all the above mentioned ailments. As he gazes through the mud-brick portico at the distant mosque he imagines the joy he'll feel while kneeling on his prayer rug and no longer burdening his prayerful neighbors with his medical problems. 9 7/8 X 7 3/16 inch medical cardboard.